Reduces exposure and handling risk. High quallity, high density polyethylene. Calcium free and can easily be recycled. Resistant to UV rays, acids and alkalis. Lockable, complete with standard lock. 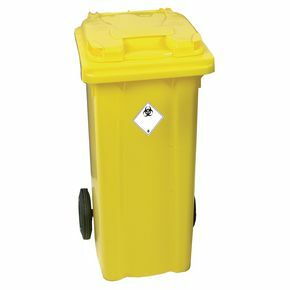 Whether you work in a hospital, a Doctor's surgery or Veterinary Practices our clinical waste bins will suit your needs. They are both hygienic and secure which is highly important in a clinical environment. They come complete with a standard lock so you don't have to worry about your clinical waste being accessible to un-authorised persons. Our bins would even suit being used in laboratories as they are resistant to UV rays, acids and alkalis, making them robust and difficult to damage with chemicals. They are yellow which makes them easily visible, reducing the risk of anyone walking into them and knocking them over. To top it all off they reduce exposure and handling risk, what more could you ask for in a bin designed with scientific and medical environments in mind. Our bins are available in 120L, 240L 360L and 1100L; they come with 12 months Guarantee and FREE Next Day UK Delivery.